Ramos-Horta called the food situation “very precarious” and estimated that about 200,000 displaced people were hiding in the mountains after being pursued by militias and renegade Indonesia security forces wreaking destruction across the territory. The United Nations said today that refugees in East and West Timor were scavenging for food, eating plant roots and facing starvation unless emergency aid airdrops arrive soon. The looming catastrophe comes just of a week after Indonesian-backed militias unleashed a systematic campaign of terror in East Timor after confirmation that voters had opted resoundingly for independence from Jakarta in a UN-backed vote. Yesterday, Indonesia’s President B.J. Habibie reluctantly bowed to international pressure to allow a UN peacekeeping force to enter East Timor and restore order. Until now, Jakarta, and particularly its hard-line military, had defiantly refused to permit outside forces into the former Portuguese colony, insisting as late as Saturday night that it could quell the violence itself. However, that stance crumpled under pressure from governments around the world horrified by the slaughter sweeping the country of 800,000. Allan Nairn, from Dili, East Timor. Hundreds of thousands of refugees in East Timor are scavenging for food, eating roots and facing starvation and malaria, but aid agencies said today they could not safely deliver aid. Food, medicine and emergency shelter supplies are stockpiled, but the agency says they couldn’t move into the bloodied territory yet. They’re hoping air drops would be possible soon, despite continuing violence from the Indonesian-backed militia. Indonesian President B.J. Habibie yesterday agreed to allow UN peacekeepers into East Timor, where possibly thousands have been killed since the territory voted on August 30th for independence from Jakarta. But peacekeepers are not due to land for a week, says Australia, which says it will lead the 7,000-strong force. There were grave fears for tens of thousands of refugees who have either fled or been forced into neighboring West Timor, which is an Indonesian province. The US President also hinted that Washington, which cut military ties and suspended arms sales to Jakarta because of the carnage in East Timor, would return to a more helpful stance if the peacekeepers deploy quickly. He said quote, “If that happens, then we can resume our work with the people of Indonesia, the world’s fourth largest country, to help their transition to democracy and the restoration of prosperity there.” Berger said he hoped the force would deploy within days — Berger, being Sandy Berger, the National Security Adviser. And he said any US decision to be more supportive of Indonesia, for example, in seeking International Monetary Fund and World Bank money, depends on the mission’s success. 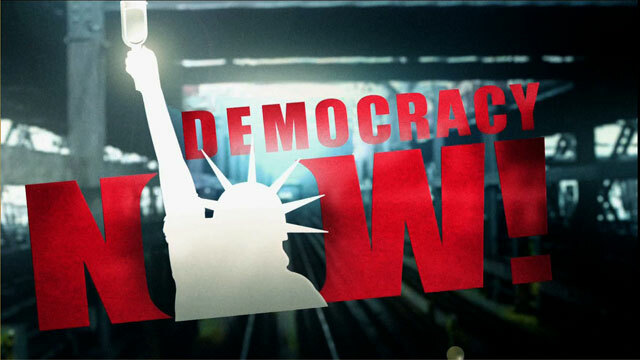 Welcome to Democracy Now!, Allan, from Dili, East Timor. Allan, this latest news, President Clinton saying that perhaps, although he has already announced the cutoff of military aid as well as arms sales to Indonesia, which clearly is what has brought Habibie and General Wiranto to their knees and forced them to accept an international peacekeeping force, which they had refused to accept earlier in the week — what is your reaction, first, to a peacekeeping force in Timor and, then, to President Clinton saying, well, perhaps the military aid and weapons will be restored when the peacekeeping force moves in? Well, first of all, the peacekeeping force is not the issue. The issue is whether Wiranto turns off the terror. He can do it with the push of a button. That’s been made clear many times. So the question is whether he chooses to push that button. And that is determined by whether a real pressure is being exerted on him by Washington or whether it isn’t. At this point, we probably don’t have enough information to say. The US has publicly announced these military cuts. There are rumblings from the IMF. But we don’t know what they’re actually telling Wiranto behind the scenes. There were some quotes on the wires this morning from Clinton regarding the military cutoff that are ominous. They make it sound as if Clinton is looking to restore US military assistance to Indonesia as soon as possible, as soon as Timor drops out of the headlines. If that is the case and if that is the message that Wiranto is getting from Clinton, then it’s very possible that Wiranto will keep the military terror and the militias going for a few more days or a few more weeks. That’s the real issue. A peacekeeping force is a secondary issue. However, on the issue of the peacekeeping force, I think it would be crazy for people to think that a US — that US and/or Australian troops should come in and shoot it out with Indonesian troops that have been armed, trained and financed by the US and Australia. There’s no need for that. Washington and Canberra and London simply have to cut Jakarta off, and the terror will end. Beyond that, I think it would be politically horrible for Timor to start its life as an independent nation under — you know, essentially under Australian or US military occupation. Haiti had a very bad experience with that recently, when President Aristide was flown back on a US military helicopter after his arm was twisted by Washington into abandoning his populist economic program and instead accepting the World Bank/IMF program, which has caused increases in hunger and a general collapse of peasant farming in — abetted a general collapse of peasant farming in Haiti. If Xanana comes back to Timor on an Australian military helicopter or a US military helicopter, and the Timorese leadership spend their first few months of political work being whisked around in Australian and US armored personnel carriers, it’s a very bad beginning. It really constricts the possibilities of democracy in Timor. And again, it’s not necessary. There are no out-of-control forces on the streets of Dili. There are no out-of-control forces in the countryside of Timor. They are all tightly controlled through the chain of command from Jakarta by General Wiranto. And General Wiranto, as the institutional head of the TNI, the Indonesian military, is eminently, with exquisite sensitivity, responsive to pressure from his patrons, from Washington mainly, but also London and Canberra and the IMF. So if they seriously — and we all — politicians know all know how to convey a message, whether you mean it or whether you don’t mean it. If they all say to Wiranto, “It’s over. You’re cut off,” then the terror will stop. That’s the issue. What do you think it will mean if Australian and some US troops move into the territory? What will it look like? Well, again, it all depends under what conditions. I mean, their presence here, in and of itself, doesn’t mean much. The most important thing is the Indonesian military militia terror shutdown by orders from Wiranto. That’s the important thing. If it is shut down, then, you know, the Australian or US or other UN troops won’t have much to do here. They’ll find that the Timorese will be, I think, very peaceful and law-abiding, and the troops will mainly be hanging out on the street corners. They won’t have a lot to occupy themselves with. 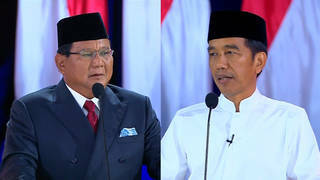 But if Wiranto decides that he can get away with playing a game and taking this further, and the militias and the army continue to stage attacks on Timorese, and the international forces are then put in the position of occasionally confronting them, that would be unnecessary and very bad. I heard today secondhand — I didn’t hear this statement directly, but I actually heard it from a refugee who heard it on Indonesian radio — a statement from an Indonesian politician representing one of the Islamic-based parties in Jakarta, and this politician reportedly said how ironic it is that here the United States approved the invasion of Timor in ’75 and then backs the army all through the occupation, and suddenly the US wants to play the hero by coming in, you know, backing a peacekeeping force to liberate Timor. And I mean, I think that analysis is slightly off, but it’s not off by much. I mean, I think he has got a real point. It’s very close. The analysis is off slightly in the sense that the political forces in the US that approved the invasion of Timor and that armed and financed the occupation are different from those that have brought about the recent change in US policy. I mean, it’s really been grassroots lobbying and pressure and bipartisan congressional action, all in the wake of the Santa Cruz massacre, that resulted in the recent change in Washington’s posture, you know, Washington supporting the self-determination vote in Timor, Washington claiming they’re going to cutoff the military aid to Timor, Washington claiming they’re going to pressure the IMF regarding Timor, etc. These things did not happen because Clinton wanted them to happen or because the Pentagon or the State Department wanted them. They happened because those powers were dragged, kicking and screaming, by the American public, by the mobilized American public, you know, through groups like the East Timor Action Network and others and many members of Congress from both parties who stood up and really made this an issue. That’s how that happened. But I could certainly see how Indonesian politicians and others looking at this can feel kind of bitter about it, if the US does suddenly come in at the last moment with troops and claim to be the liberator of Timor. I mean, what an ugly display that would be after the history of what Washington has done here. What do you think forced President Clinton to turn around after so many years of grassroots activists lobbying for a cutoff of military sales, of military training, of IMF-World Bank funding. President Clinton has just pressed forward with military sale after military sale, despite the fact that a third of the population has been killed, the last few days. Was it the bodies of the Timorese piling up or the media spotlight on them for the first time in this quarter-century? Well, politically, the noose was — you know, the circle was tightening. Starting in the fall of ’92, about one year after the Santa Cruz massacre, Congress cut off the IMET military training aid to Indonesia, just as a result of grassroots pressure. And in the years after that, those of us who were pushing for that, we were able to win a series of victories. And then in the past couple of years, it really did come to the point where we actually held the balance of power in Congress on this issue. You know, the advocates of self-determination for Timor and democracy in Indonesia and an end to US support for the Indonesian military actually had more support in Congress than did the Pentagon and the old-line State Department people and the CIA and the White House. And so, on vote after vote, we were able to defeat them. And in the past year, both houses of Congress, both the Senate and the House, for example, passed resolutions in favor of self-determination for Timor, in favor of a UN-sponsored vote. So, you know, the political circle was slowly closing in on the White House. And then, I assume, although I haven’t — I really haven’t been able to see any of the world press in the past week, since I’ve been here in Timor, but from what I hear, there’s been a lot of it. Timor has been on the front pages. It has been on a lot of the evening news shows and certainly the world broadcasts, like BBC and CNN. And all a case like Timor needs is a little exposure. Mass murder, church massacres, systematic torture, army butchers running wild in the streets, all you need is a little bit of a clean light on that, and, you know, the public gets pretty alarmed. So I assume that that press coverage, twenty-four years late, but coverage nonetheless — I assume that is probably what pushed Clinton over the edge. And, of course, if that press had been there on November 12, ’91, outside the Santa Cruz cemetery, you know, if we’d had a few CNN and ABC and NBC and CBS cameras there next to us grinding away as the soldiers were marching up, I bet the soldiers would not have opened fire. Certainly, if they had all been here in ’75, as Suharto and his army were contemplating invasion and then as they were storming ashore, the genocide wouldn’t have happened. But I guess better late than never. Allan, we have to break for stations to identify themselves. When we come back, I want to ask you — I know there have been rumors over the last days of even the skeletal staff of the United Nations pulling out. I want to ask you what that would mean. Allan Nairn, US journalist, reporting from Dili, East Timor. You’re listening to Pacifica Radio’s Democracy Now! We’ll be back in a minute. You’re listening to Pacifica Radio’s Democracy Now!, as we go live to Dili, East Timor, where the terror continues. The latest reports we have, Jose Ramos-Horta, the Nobel Peace Prize winner of East Timor, in Auckland, New Zealand, saying that hundreds of thousands of people are in the mountains. They need an airlift immediately to get food, as people are rummaging, looking for any kind of root to eat. Another 100,000 people over the border in West Timor, forced there, they’re in refugee camps, yet they are being terrorized by the very same Indonesian-backed militia that’s in East Timor right now. They have no protection. This is an Indonesian province, West Timor. And journalists are also threatened, as well as aid workers. So Indonesia is very much controlling the level of international exposure, even now, even as they’ve been forced to accept an international peacekeeping team. Allan, before I ask you the question about the UN, are you concerned, in these few days before this peacekeeping force comes in, that since now Jakarta is saying OK — the way they’re saving face is “We are out of control. We will work with a peacekeeping force” — that it will give the green light for even further terror, and the Indonesian military can say they’re washing their hands of it. Yes, that’s a very big danger. A lot of people here are very worried about that. It’s quite possible that when the final Indonesian soldier leaves, there will be a big blast as they go. Yes, the final hours could be very bad. What about the United Nations and the UNAMET compound? That’s the United Nations Assistance Mission for East Timor. We’re talking to Allan Nairn in East Timor. Allan, what has happened over the last few days in Dili, since we’ve spoken to you, since the UN mission, the Security Council, five ambassadors came to Dili? Well, the [inaudible] the intensity of these days, it’s very hard to know. This is all based on scattered impressions. They’re not doing the massive gun firing into the air, at least in the southern part of town, that they were before. They are still torching houses and buildings. Just a few hours ago, before sundown here, you could see a very large column of smoke coming from what people were guessing is the Forestry Institute, and then there were many individual houses that were still being set on fire. In the streets of Dili, they’ve been leaving bodies out in the open to rot. There were two bodies of young men next to the canal, river that runs behind the new cemetery — I’m sorry, the new seminary near the Santa Cruz cemetery, the scene of the ’91 massacre. Those two young men have been out there for several days now, and the refugees inside the seminary have started to complain that they can’t eat because of the stench. The stench of the decaying bodies is wafting in. And there’s also a report of another body, similar area, a bit further south and east, this one with the stomach distending and starting to crack. You know, it sounds like another shot in the psychological warfare, the war of terror: just leaving the bodies out is a message to people. Also in the past twenty-four hours, several waves of people have come down from the mountains, come down from Dare, where thousands of refugees had fled with the news that food is very low there. People have been living off of cassava, and they’ve basically just stripped the coffee plantations where they’re living of the cassava. They already finished up the bananas a while ago. Food is very, very sparse. And also, on Saturday, the Kopassus Red Berets attacked a Dare church and killed at least one person, a woman in her late thirties, early forties, named Inocencia. And also, around the UN compound, I think one of the recent times we talked, I mentioned that some noodles had started to appear in the diet of the refugees. Well, a lot of these noodles are being sold by the military people, who — they’ve stolen them and sacked them from various homes and aid agencies, and they’re selling them at a 600 percent markup for those refugees who have a little cash. Allan, anything else you want to add on this day that the UN Secretary-General will be meeting with Ali Alatas, the foreign minister? Do you find any problem with the United Nations consulting with Ali Alatas on how this peacekeeping mission should go forward? And speaking of the UN Secretary-General, the comments that he made at a news conference on Friday, when asked by Farhan Haq of the Inter Press Service whether he felt that we should be looking at an international war crimes tribunal, whether the leaders of Indonesia have committed crimes against humanity, and Kofi Annan actually said yes, this was something to look at. Yeah, that’s consistent with the written statement he issued the other day. I think that’s very significant. In fact, in the written statement he issued, he didn’t specify the leaders of Indonesia; he just said “those responsible for these crimes.” And if you take that seriously and if you take that literally, that would implicate not just people like Wiranto and all the Indonesian generals over the years, you know, people like General Murdani and General Sutrisno and so many others, it would also implicate their accomplices, people who — like Ford and Kissinger, who gave the green light for the invasion, like Jimmy Carter, who sent in the planes and helicopters that they used to bomb the Timorese out of the hills in the crucial period in ’77 and ’78, when they herded them down into death camps. You would have to seriously look at these US officials as accomplices. Now, I don’t think — I’m definitely putting words in Kofi Annan’s mouth there. I don’t think he would mean to suggest that members of his Security Council should be put on trial for crimes against humanity, but I’m suggesting that. And I think if we’re going to be honest and consistent and serious about enforcing international law, then you have to be willing to look at it with clear eyes and not give political free passes to nations or leaders just because they happen to be very powerful. Allan, I want to thank you for being with us. Allan Nairn, reporting to us, as he has been over the last few weeks, from Dili, East Timor.